Training is an integral part and continuous process of capacity building and institutional development initiatives of a development organization. Training ensures the improvement of the human resources through the acquisition of advance knowledge and skills as per the changing requirements of times. It contributes to the realization of sustainable innovative and effective operations. 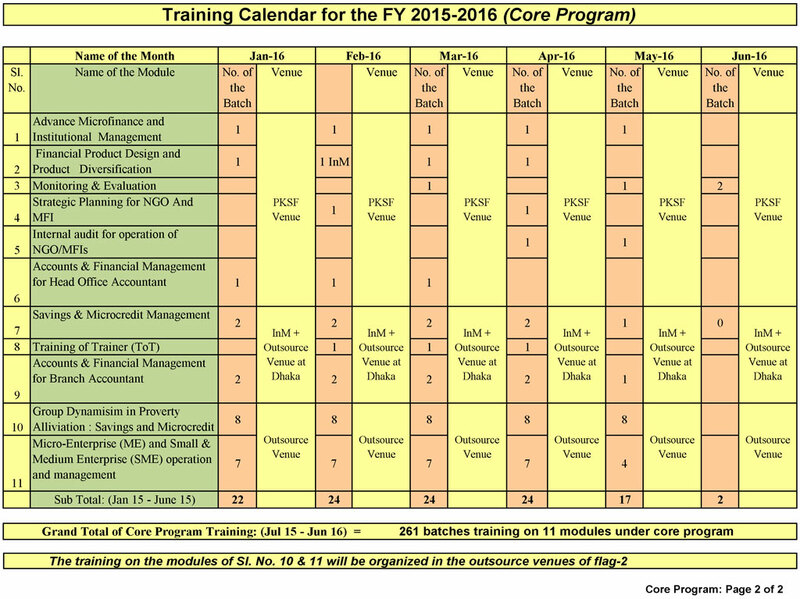 Training Section of PKSF regularly provides modular training and customized programs for its own officials, the officials of Partners Organizations (PO), borrowers and also for other development practitioners. 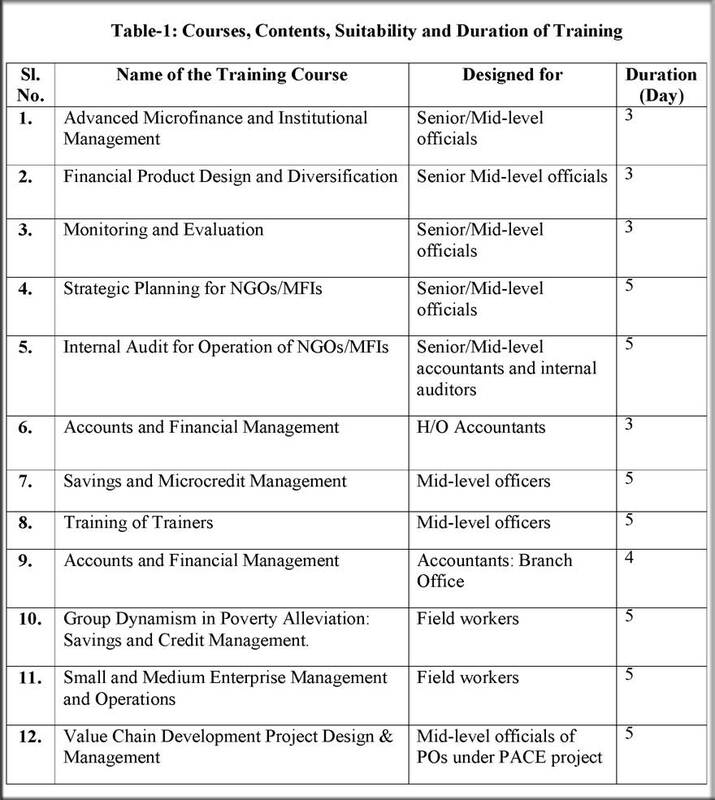 PKSF provides training in the broad areas of Microfinance and Development. PKSF training modules are particularly designed for POs’ staff along with Executive Committee members on different diversified issues of Development and Financial services. These modules are updated on a regular basis according to the needs and observations from filed level experience. Till date, PKSF has developed around 35 modules on various interventions towards poverty reduction and employment creation. Following modular training courses are available at present. Initially total training cost of POs was borne by PKSF. In course of time as the POs have become capable PKSF decided that the cost should be shared. It is now charged at 80%, 60%, and 50%, depending on the category and status of POs: large, medium and small. PKSF provide modular training for the employees (Mid level officials/Field Organizer) of its Partner Organizations through outsourced organizations too. It has 23 enlisted outsource venue. While outsourcing training venues PKSF tries to ensure quality of the venue, including facilities, management, cleanliness, etc. Another important criterion for selection is the suitability of the venues to the trainees— Mid level officials/Field Organizers. Since its inception, PKSF welcomes overseas participants to showcase its activities and also the best practices of the microfinance sector of Bangladesh. The training module and total program is designed keeping in view of the interest and demand of the foreign participants or delegates. PKSF takes care in the selection of resource persons also. PKSF welcomes request to organize trainings/orientation for employees of non-partner NGOs/MFIs, Government and semi-government organizations on different areas of microfinance management and social development. PKSF provides opportunities for interns of graduate and post graduate students of different public and reputed private universities and institutes as its corporate social responsibility. The internship programme includes the classroom session at PKSF, along with field level activities relating to diverse poverty alleviation programmes, inclusive financing and social development initiatives of PKSF. Students from all public universities and 9 renowned private universities of the county are eligible to internship at PKSF. Overseas students/fellows from different renowned institutes can also apply. PKSF’s training department is headed by Deputy Managing Director (Administration). Presently, the wing is supported by a seven-member team (one Assistant General Manager, one Manager, two Assistant Managers, one Officer and two junior officers). PKSF has a talented and experienced resource pool comprising of officials at different levels of PKSF. Each outsource training centre has an independent resource pool comprising of 5 to10 members.